I guess I don't need to tell you that I'm from Russia, but in case you don't know -- I am! I am also hearty and robust, with rather 'square' features. 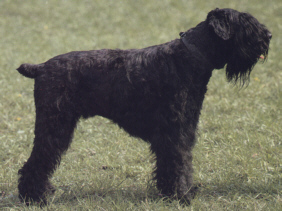 My breed was developed by crossing three Western breeds: the Giant Schnauzer (which is called the Russian Bear Schnauzer in Russia), the Rottweiler and the Airedale Terrier. My facial features mostly resemble the Giant Schnauzer, but I've got a heavier, thicker body. I do guard dog duty mostly, which means that I have to be outside a lot -- so I have a nice long thick coat to protect me from the harsh Russian winters. As you've probably noticed, my coat is black, but some members of my family have more of a salt and pepper colored coat, which is fine too. Being a guard dog means that I have developed a pretty aggressive personality, so I'll need training, discipline and careful handling if you expect me to become a gentle family pet. When fully grown, I am between 25 and 28 inches tall (63.5 to 71.1 centimeters). We have no Black Russian Terrier Breeders listed at this time. Click here to place your Black Russian Terrier Ad!